Never before have I experienced such heartfelt ovation as after Sophie Hunger‘s set tonight at La Boule Noire in Paris. Capping the evening on her second encore, sung in Swiss German, the Zurich artist and her band bowed numerous times, visibly overwhelmed. Without a doubt, this relative newcomer will surpass expectations in the years to come, as she has since her debut at the end of 2006 during the Montreux Jazz Festival. The evening opened with Ed Laurie, an English folk singer-songwriter. Without previous exposure (he was featured on NPR’s Second Stage, I later found), he evokes a comparison to a simplified Andrew Bird, lacking the soaring flourishes and focused more on the core telling of tales. The short set was gorgeous, punctuated with his short story, spoken in French with brief calls to the crowd for help in remembering words. The tale, an anecdote for how he views death, involved a friend’s bird flying circles around the ceiling, watched by a cat, before the cat opened its mouth and the bird flew directly in. Aside from that, an ode to Albert Camus, entitled Albert, drifted the crowd into a dreamlike state both with its beauty and gentleness lyrically as well as musically. Sophie Hunger shortly followed, solitary at the piano for the first before her band joined her. Her voice, her talent cannot be adequately expressed (the sole comparison I can think is that she gives Ani Difranco’s astonishing presence a run for her money). Her voice calls forth the best aspects of the following; the emotion of Adele, the power of Amy Winehouse, and the warm soulfulness of Norah Jones. The night, truly without a favored moment, led her to the piano and from her acoustic or electric guitar, often accompanying exquisite playing with gorgeous lyrics in Swiss German as well as English. The band remained silent much of the evening, enthralled in the art of music. Michael Flury, on trombone, revives the brass, utilizing the mute and plunger to create haunting, hollow drones. As on Shape, these drones are held by punctuated plucked guitar before the build gives way to handclaps from Balz Bachmann and Julian Sartorius. Once again, the audience remained mesmerized, overwhelmed; leaving those claps just for the musicians, and not the crowd. Another first. The Swiss chanteuse debuted three songs over the course of the night, one previously unheard. During the first of two encores, Hotel Belfort was debuted following a to-be-mentioned track. Acoustic, the new song does nothing but solidify her musical ability “Personne n’est jamais ready…” (“No one is ever ready”) Just before, the sold out crowd were lifted through the epic, Rise and Fall, pillowed by Hotel Belfort at the end. The sparse landscape of piano notes, despite being backed by the band at the time, pulled the crowd upwards until the English lyrics gave into a thundering dramatic piano incline into a chorus of Swiss German. Although many may not be able to understand that language, the beauty of each word, even with the linguistic differences in pronunciation, was the consistent highlight of the evening. 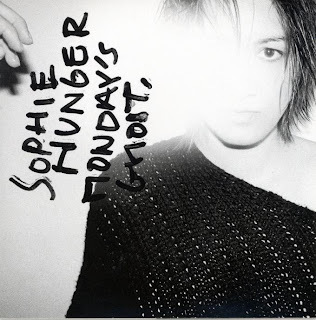 Her second album, Monday’s Ghost, is currently unavailable in the United States, a true tragedy that needs to be amended. Until then, her debut Sketches On Sea is the only piece available (via iTunes). Sophie is currently touring Europe, Monday’s Ghost will be released May 4th in the UK. It is currently out in France via Universal France. She will finish a six night séjour at La Boule Noire in Paris on Saturday evening, already sold out.